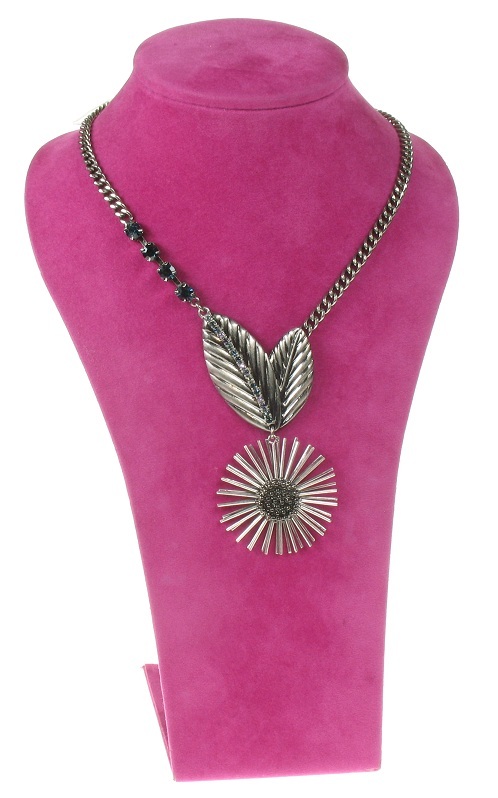 Elegant leaf drop necklace, decorated with Swarovski crystrals in shades of blue, purple and lilac. Length of front drop 5 inches/13cm. Length 18 inches/46cm to an adjustable 21 inches/53cm. The flower measures 2.5cm/25mm. Hematite and silver plate mix. 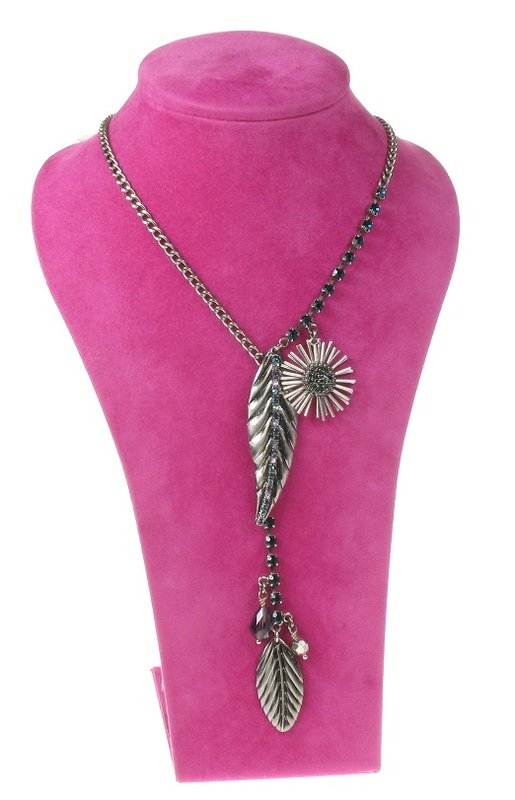 Stunning leaf and flower drop necklace, decorated with Swarovski crystrals in shades of blue, purple and lilac. Length of front drop 3.25 inches/8cm. Length 18.5 inches/47cm to an adjustable 21.5 inches/55cm. The flower measures 4cm/40mm. Hematite and silver plate mix. Beautiful leaf and flower motif bracelet, decorated with Swarovski crystrals in shades of blue, purple and lilac. Length 6.5 inches/16.5cm upto 8.5 inches/21.5cm. The flower measures 2.5cm/25mm. Hematite and silver plate mix. 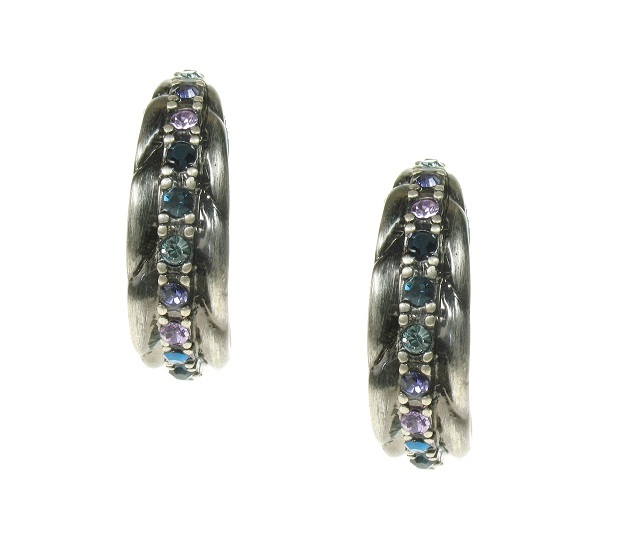 Crystal studded hoop earrings with post and bullet back for pierced ears. 2cm/20mm diameter and 7mm wide. Swarovski crystrals in shades of blue, purple and lilac. Hematite plate. Crystal studded double hoop earrings with faceted crystal drops, post and bullet back for pierced ears. 2cm/20mm diameter and 4cm/40mm length. 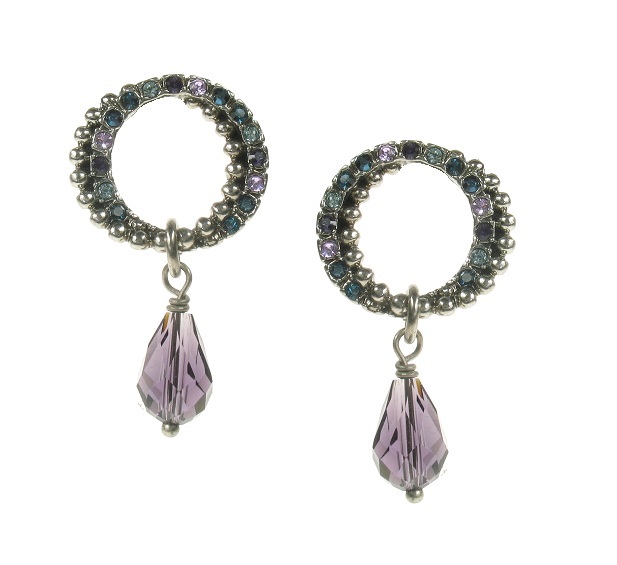 Swarovski crystrals in shades of blue, purple and lilac. Hematite plate. 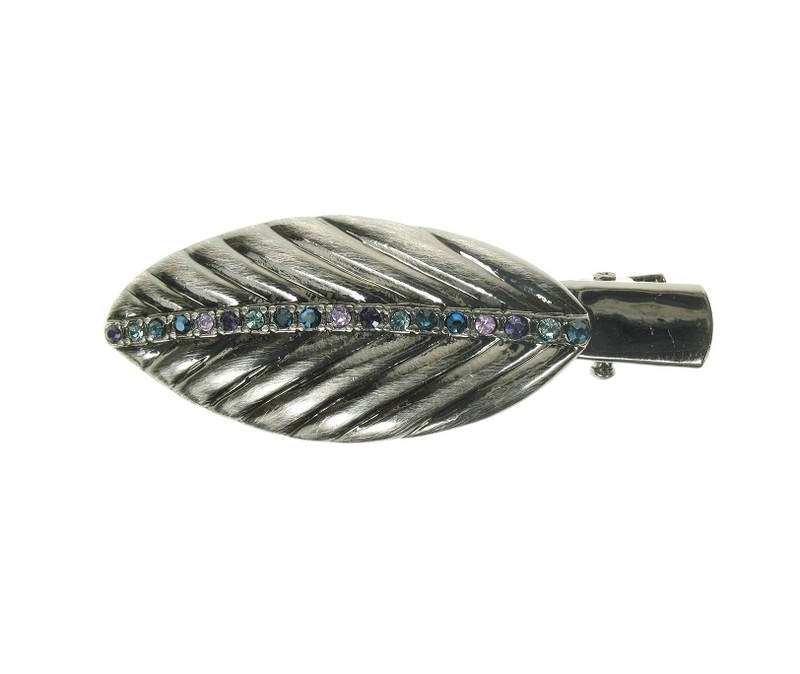 Pretty leaf shaped hair-clip, witha vein of Swarovski crystals in blue, purple and lilac. Total length 5cm/50mm. Sprung clip (measures 4cm/40mm) for a section of hair. Hematite plate.